Learn about the Chief Medical Officer of Health and their role in public health protection. The Office of the Chief Medical Officer of Health provides public health expertise to support health surveillance, population health and disease control initiatives on issues of public health importance. Dr. Deena Hinshaw was appointed the Chief Medical Officer of Health in Alberta on January 28, 2019. She is supported by the Deputy Chief Medical Officer of Health, (currently vacant), and Deputy Medical Officer of Health, Dr. Kristin Klein. The Chief Medical Officer of Health is a member of the Alberta Health executive team and reports to the Deputy Minister of Health. In extraordinary situations, such as a public health emergency, to ensure the welfare of Albertans, the Chief Medical Officer of Health may report directly to the Minister of Health. Dr. Deena Hinshaw completed her undergraduate degree at Augustana University College in Camrose, Alberta. She did her medical degree, Masters in Public Health and residencies in family medicine and community medicine at the University of Alberta. Dr. Hinshaw worked as a Medical Officer of Health in the Central Zone of Alberta Health Services from January 2010 to July 2017. She also served as the Medical Officer of Health lead in the area of public health surveillance and infrastructure for Alberta Health Services from 2014 to 2017. 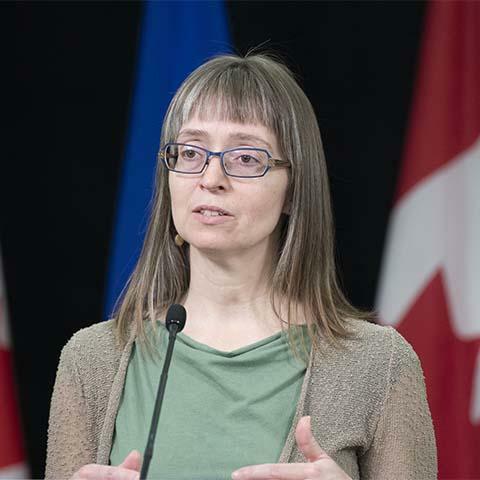 She served as Alberta Health’s Deputy Chief Medical Officer of Health from 2017 to 2019. The Deputy Chief Medical Officer of Health assists the Chief Medical Officer of Health in promoting and protecting the health of Albertans under the authority of the Public Health Act. The position of Deputy Chief Medical Officer of Health is currently vacant. The Deputy Medical Officer of Health assists the Chief Medical Officer of Health in promoting and protecting the health of Albertans under the authority of the Public Health Act. Dr. Kristin Klein was appointed Deputy Medical Officer of Health in August 2016. Dr. Klein has a Bachelor of Science from the University of Calgary and a Medical Doctorate from the University of Alberta. She completed her post-graduate medical training in Public Health and Preventive Medicine at the University of Alberta. Prior to joining Alberta Health, Dr. Klein worked with the Health Technology and Policy Unit at the University of Alberta. Her major areas of interest include communicable disease control, surveillance and evidence-based policy development.